A blog about peace because, "if not now, when?" I’m going to get a bit technical for a paragraph, but bear with me. The horizontal axis represents time. 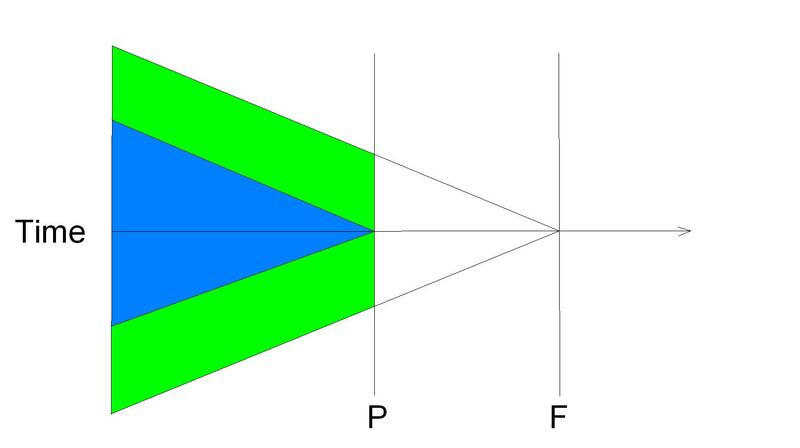 The vertical line labeled P is the point in time representing the present moment, and the vertical line labeled F represents a point of time in the future. The blue-shaded area is a representation of what we are able to see of the universe at the present moment. Things that are farther away than light can travel, in the time since the start of their existence, are imperceptible to us – they are outside the blue area. At some future time, F, we will see more of what actually existed at this present time, P, because light will have had time to reach us from more things. This is represented by the green-shaded area. When I read this, it occurred to me that these limitations apply not only to cosmological entities that are billions of light-years away – they apply to our understanding of our very own lives: why we have done the things we’ve done, and what effects those actions have had on ourselves and others. Events that we are not even aware of, or are incapable of understanding at the time they happen, can have monumental effects on how we perceive ourselves in relation to the world. As time goes on, we learn more about what was happening around us, and we are able to perceive and understand the causes of those effects as their light reaches us for the first time. An adult learns about the financial struggles his parents had, and finds peace with the resentment he had held as a child because he couldn’t have the kinds of clothes and toys other kids at school had. A co-worker learns that someone’s mother was diagnosed last week as terminally ill, and suddenly understands that person’s distraction rather than being irritated by it. My previous post is an example of this happening in my own life. We can keep peace in our hearts far more easily if we try to maintain a constant awareness that there are so many presently-unseen influences acting upon every person we meet. A person who rushes past on the sidewalk and bumps you, and just hurries on without so much as an “excuse me”, may have just been notified that her child has been hurt at school and can think of nothing other than getting to the school as quickly as possible – or, she may just be a habitually rude person. The difference in our reaction to those two causes for our being bumped is significant. In the first case, we would feel sympathy and be more likely to be nice to the next person we interact with. In the second case, we would feel irritation and be less likely to be nice to the next person we interact with. (Admit it.) Either way, that next person is affected by our having been bumped – something that they have no knowledge of and had nothing to do with causing to happen. Do you want to be responsible for having a positive, or a negative, effect on that person? Leaving aside, now, the effect on the next person we meet, the question is: at any point in time, would you prefer to feel peaceful, or irritated? I think that most people find it unpleasant to feel irritated. So, if you have no way of knowing the actual reason that someone bumped into you, then it is even to your own advantage to imagine a reason for it that leaves you feeling peaceful than to assume one that leaves you irritated. Effect and Cause, or Cause and Effect?